Brush every tooth carefully and slowly. cleaned above, below, and on each brace. tongue and the roof of your mouth. 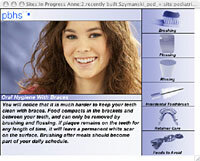 Floss nightly to remove the plaque missed by brushing. Carefully thread floss under the wire. Wrap a “C” shape around one of the teeth and slide the floss up and down gently. Move the floss to the tooth next door, wrap a “C” around it, and floss there as well. Continue this way and floss around each tooth.